Friendly, helpful hosts. Clean and comfortable studio with excellent wifi. in Lindos, you cannot take cars in the city, you have to walk a lot if you park your car somewhere but for this property the car park is very close. Otherwise good luck walking up and down the town. 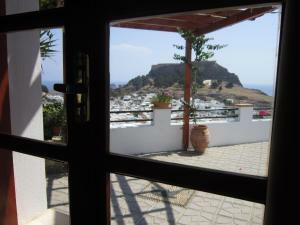 Chrysa has parking very close and has one of the best views in Lindos. Un blocked views. 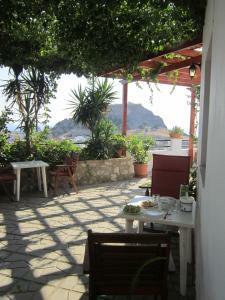 The place had a fantastic view over the Lindos town and also to the acropolis. 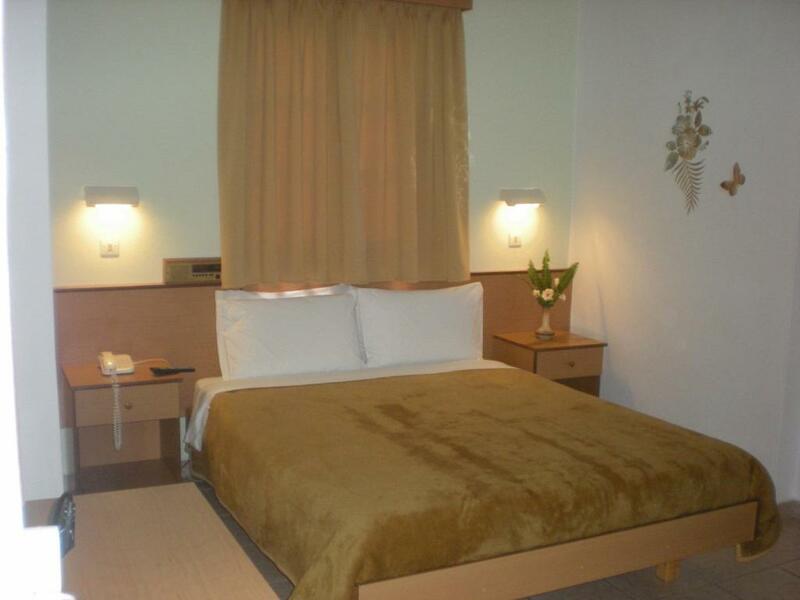 Room was very clean and kitchen well equipped. There were a lot of stairs to go up to this place but the view compensated it nicely. The terrace outside our room was a lovely place to have breakfast. It was a bit cool at night because the season was just starting but the a/c + heater was great. The hosts were very friendly. The location was perfect and the view from the terrace, on Lindos and Acropolis, was really magnificent. We could make 2 nice hikes from here. 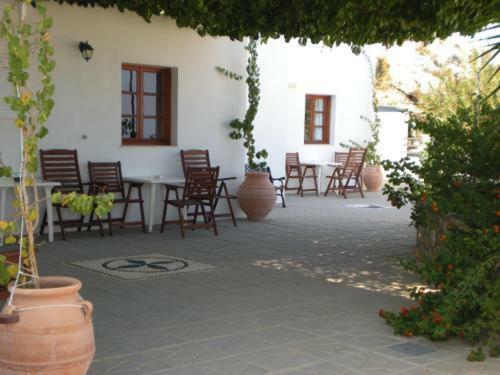 Great Location and views, nice quiet place with a small courtyard to sit and have breakfast (not available at hotel) or a glass of wine in the evening. The Hill is very steep for elderly people but not an issue for us, we did however take a taxi from the bottom of Lindos town after having a few drinks and this was 5 euro. Stunning view from lovely balcony. Quiet. Cleanliness of apartment. Beautiful location, with stupendous views. Lovely courtyard where we sat morning and evening. Room was comfortable and well equipped, so much so that we decided to cook in one night. Effie and Panayiotis were very friendly and kind. Effie helped us when our hired car broke down. She phoned the company several times and arranged for them to bring us a new car. Lovely greeting from owners...so pleasant and helpful....spotless clean....and wonderful werk. 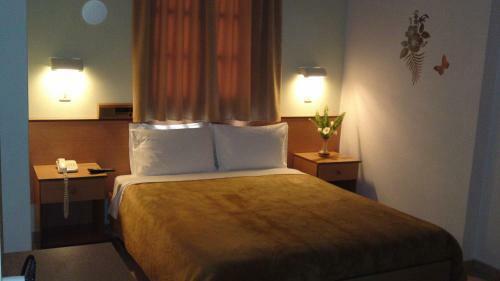 Lock in a great price for Chrysa Studios – rated 8.9 by recent guests! 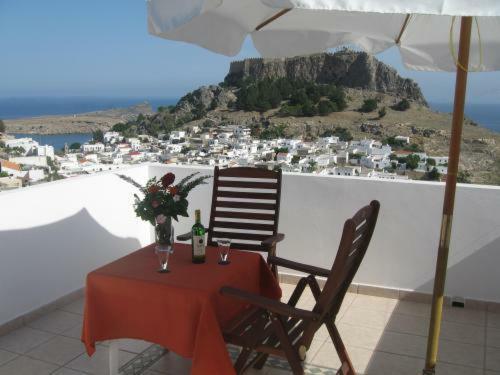 One of our top picks in Lindos.Boasting unbeatable sea views, Chrysa Studios offers well-furnished studios with free Wi-Fi, just a short walk from all the attractions. Chrysa’s clean and comfortable rooms feature private kitchenettes and are well-equipped with satellite TV and safe, as well as tea-and-coffee-making facilities. 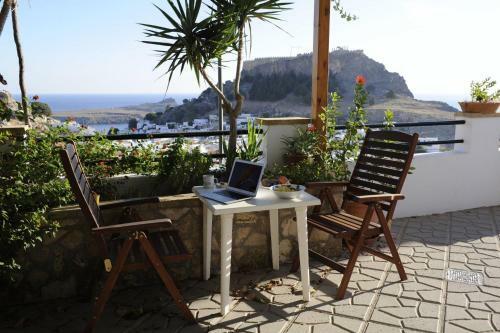 In the evening, guests can relax at Chrysa Studios’ charming communal courtyard, or sip a drink on the balcony and take in the panoramic hilltop views. Chrysa Studios enjoys a prime location overlooking Lindos. It also benefits from outside parking facilities and easy access to the main road. Just a short walk from your studio will lead guests to all of Lindos’ popular attractions, including the lively beach and the village center. 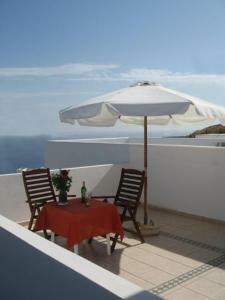 When would you like to stay at Chrysa Studios? Includes kitchenette with fridge, air conditioning and satellite TV. This studio includes air conditioning, a satellite TV and a kitchenette with a fridge. Offering sea views, this studio includes air conditioning, a satellite TV and a kitchenette with a fridge. House Rules Chrysa Studios takes special requests – add in the next step! Chrysa Studios accepts these cards and reserves the right to temporarily hold an amount prior to arrival. Please contact the hotel directly by email or telephone to advise them of your arrival time in Lindos, as the studios do not have a reception. It would have been better if I had written to the owners before and maybe got a map to the location, because it was a bit hard to find even with the help of the owner on the phone. It's located right at the top of the hill, which is fine but could be difficult if walking isn't your thing. Lovely view across the town and very quiet. The accommodation was exactly as described. The views from outside the apartment on the shared terrace were incredible. The beds were comfortable. Despite arriving later than planned we were met with a smile. The incredible views also mean you are the top of a very steep hill down into town/ the beach. You need to be very firm footed and fairly fit if you are planning to walk. Bathroom door a bit noisy and toilet push button in poor state. Floor cleaning detergent or mop released a weird odour. Gorgeous view and outdoor space. Quiet and cosy. Extremely clean. Studio comes with all the essentials. Nice owners, helpful and unpretentious. Very relaxing and enjoyable. Easy to get to from the main street. Parking available although on a slope. Location not busy at all considering how crowded Lindos can get. Close to st. Paul's bay. Sheets were a bit worn and rough against the skin. We loved the amazing view from the terrace! Walk into town down the steep hill. It was quite hot when we were there so the climb back up to the studios was exhausting. 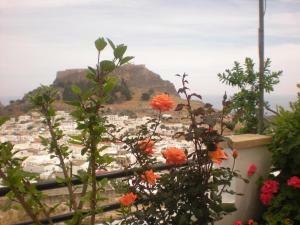 Fantastic view do the city of Lindos and coloseum. Lovely shaded deck. Hot shower. Kitchenette for breakfast since the studios do not provide breakfast.